If you own a dog, there is much more to look after than its regular needs like eating or playing. Dog owners will second the fact that dogs need to be washed and cleaned regularly, and that special care must be taken regarding their personal hygiene as well. Bathing, regular health checkups, Cleaning Your Dog’s Teeth,diet, and exercise must all be given due importance, and cutting your dog’s toenails forms one of the most important parts of regular hygiene. 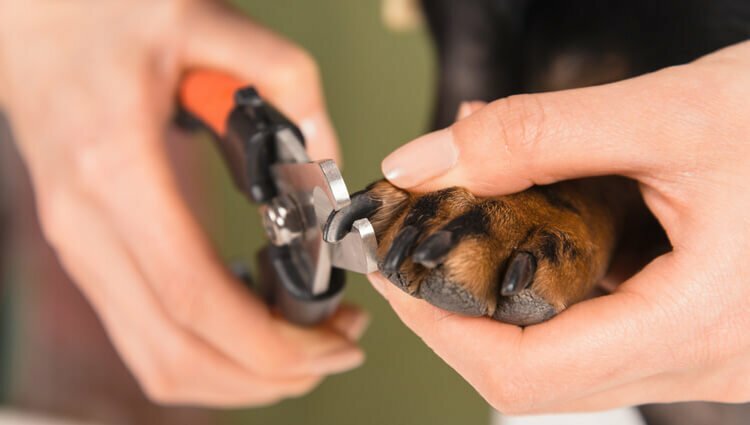 Read on to know more about the importance of trimming your dog’s nails and the consequences of not doing it. Also, by the end of this article, you will be aware of which nail clippers are the best to use on your dog and how you can go about this process with ease. 1 Why is it Necessary to trim Your Dog’s nails ? 2 Which Nail Clippers Should You Use? 3 How can You make this a Part of Your Dog’s routine hygiene ? Why is it Necessary to trim Your Dog’s nails ? The very first and foremost and the most important reason to Trim Your Dog’s Nails is that it makes your dog lose the sense of its standing ground. As you may well know, dog toenails are naturally aligned and don’t touch the ground when they walk on flat surfaces. If the length of these toenails exceeds a certain limit, it gives out a signal to the dog’s brain that they are walking atop a hill which is the only time a dog’s toenails touch the surface they are walking upon. Due to this, they are evolutionarily programmed to lean forward on their forelegs and to start applying more pressure on their hind legs which puts their bodies under unnecessary stress and is not good in the long run. Also, long toenails are dangerous as they may cut or bruise you, or kids in the house, or even your dog itself. Another risk factor if you avoid trimming your dog’s nail sis that dogs with long toenails may end up tearing your pillows and leaving scratch marks over your furniture. Which Nail Clippers Should You Use? There are special clippers designed for Dog’s Nails Trimming since they are made keeping in mind the growth of dog nails and their shape. Nail clippers meant for humans are not at all suitable to be used on dogs since they not only hurt them but are also not made to be used on dogs. One of the Best Dog Nail Clippers and also the perfect choice in this regard would be to use Guillotine clippers. They are made according to the perfect shape and size to be able to cleanly cut through the extra nail growth without hurting your dog. They are quite sharp and quick and can be used on dogs as well as pups. Ensure that you use only those clippers which are similar to scissors or of plier style. They can be easily handled, and they work efficiently. Prefer small clippers over the larger ones. Most dog nails can be sufficiently trimmed with small clippers except for the giant breed dogs. You may even use a filer afterward to smoothen out the blunt edges of freshly cut dog toenails. Instead of cutting out a big chunk of the nail, start slow and small so that you don’t end up hurrying your dog. Trim Your Dog’s Nails until you see a white end in the axis of their toenail. Keep trimming small bits till you come to this end, but not any further. How can You make this a Part of Your Dog’s routine hygiene ? The time taken for your dog’s nails to grow is different for each dog. Hence, know that our dog’s toenails require trimming only if you see them touching the ground which they walk upon. However, make sure that your exercise all safety measures when you are trimming your dog’s nails so as not to cut the quick within. Also, make cutting your dog’s nails an important part of your dog’s schedule as is its eating, playing, bathing and brushing. Make it a habit to frequently exercise this hygienic routine for your dog until this becomes a habit for it. Having said that, it is most recommended that you start cutting your dog’s nails and form a habit of your Golden Retriever Puppy Training while they are still a pup since it can get a tad difficult to do it once they grow up without knowing how it feels like to get their nails trimmed. Dogs, especially Golden Retrievers are quite soft and non-violent creatures. Even so, long nails pose plenty of risk and danger to be left just like that. Which is why, it is important to Trim Your Dog’s Nails as and when they grow long, preferably regularly. Having said that, dog owners must make it a point to use only those clippers which are specifically meant for dogs. And you can even resort to taking help from well-experienced individuals if you are about to do it for the first time.